Thank you for your interest in enrolling your child in Notre Dame Catholic Schools! We are very excited about the quality and direction of our programs and look forward to having you join the Notre Dame family. You are always welcome to visit our schools for a tour. Our admissions process is a sincere attempt to look at each child’s individual learning needs to determine if we have the most appropriate educational environment for him/her. Past school records and enrollment forms equip our admissions committee with information to best place each student. Please be sure to provide all requested documentation. Please note that applications for both Universal Pre-K and Montessori Pre-K are not available online due to the additional paperwork required for those programs. These applications may be pick-up at Notre Dame Elementary School during regular school hours. Acceptance letters are sent in late April-early May. We look forward to assisting you with any questions or concerns you may have during this important process. All families must sign up for a tuition payment plan. You may sign up or renew your Smart Tuition (our payment processing system) to set up your payment plan for this school year. This can be done online by clicking here. Tuition assistance is a separate process that must be applied for annually. Tuition assistance forms for the 2019-2020 school year must be completed by February 15, 2019. A FACTS application must be filled out by any family that will be seeking tuition assistance. There is a one-time, non-refundable application fee per household. If you have children in both the elementary and high school, make certain to add the additional child(ren) and add the additional school for Notre Dame Elementary and/or Notre Dame Jr/Sr High School. If you have questions about this process, please call tuition officer, Laurie Cardone at (315) 724-5118, ext. 11. Notre Dame Elementary School: The FACTS application for Notre Dame Elementary School must be completed online by clicking here. Notre Dame Elementary’s institution ID is 7910, you will need this to complete the application. 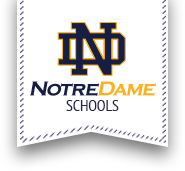 Notre Dame Jr/Sr High School: The FACTS application for Notre Dame Jr/Sr High School must be completed online by clicking here. Notre Dame Jr/Sr High School's institution ID is 7909, you will need this to complete the application. Though the application deadline has passed, you still need to complete the FACTS application to be eligible for scholarships and tuition assistance. Please call Laurie Cardone with any questions at (315) 724-5118, ext. 11.